I know we have an "Anything Games" thread, and I want my own thread for this. What games do you all feel has the most memorable architecture? For me, watching this year's SGDQ speedrun of Jedi Knight reminded me that its level architecture really was one of the things about the game that left an impact. Something about its variety in size and style seems to have more character than, say, Jedi Academy, which I also enjoyed a lot back then as a game, but its levels architecture was more "sensible" and generic relative. I feel similar between the original Doom and Doom 2016, though admittedly I've not played or even seen much of the latter. I think the original Halo was really bold w/its architecture and the followup games have done a good job of doing it justice. Team Fortress 2's environment design & art is great. Second on the Clockwork Mansion. Good lord. 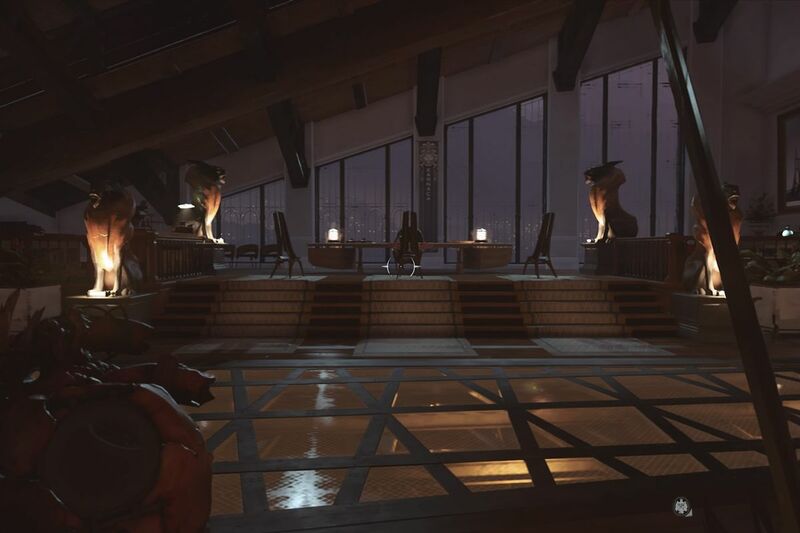 Dishonored in general (both games) are excellently designed. Also, the Shalebridge Cradle from Thief: Deadly Shadows was excellent. Not just the architecture, but the atmosphere in general was creepy as hell. A+ for the eerie feeling. I always liked Dark Forces levels quite a bit. They made the world feel very industrial. Jedi Knight missed out on that feeling in a few places. The Nar Shaddaa levels rule. Some of the levels, like the canal level, feel unimpressive architecturally in comparison. I think that's in part because they feel so random, there's just kinda water flowing randomly; what's it all there for? Barons Hed is tight though, love those levels. They're both better than JO level design, which wasn't terrible but not particularly memorable for some reason (I'm blanking). Agreed. It was passable but unmemorable. But it had some moments of terrible level design. Is there something about JK's engine that allowed for those vertical and long levels that brush-based engine (Quake, Half-life, Source) couldn't do? Last edited by ECHOMAN; 07-04-2018 at 11:10 PM. I was thinking about that. I wonder if sectors and convex geometry is really that much more suited for that application. Jon`C is really the person to ask. Good to see chucking Kyle's dead body through the air to finish the level is still a tactic. Unimpressive answer: Quake's engine was designed to make Quake, and JK's engine was designed to make JK. There are lots of small differences between the two that make them better for one or the other kind of game. One major difference is that Quake used textures for static lighting, while JK used vertex painting. It's a big part of why Quake looked so much better than JK, but the trade-off was that Quake's memory demands were proportionate to level surface area. Long winding vertical level = impractically many lightmaps. But that's okay, because Quake levels were designed to be short and closed-in. Like any other example I could mention, it was a technical choice based on the kind of game they wanted to make. That's true, and I remember one such moment: there is a choice between walking through two or three different passageways. At least one of them leads to a bottomless pit that kills you. And I'm not entirely sure if there is any way to know which path is the correct one without guessing! I think Goldeneye 64 and Dark Souls have some pretty memorable architecture. I wonder if that's because they were actually good, or because we played the games so much? I can draw maps of many of the Goldeneye MP maps (and some SP maps, too), but I played that game A LOT (certain levels especially). A number of games had maps/levels that were not particularly beautiful or sophisticated, but were incredible and popular because of their simplicity - Facing Worlds, Blood Gulch, de_dust2, etc. And then there are games that are just great all the way through - Thief II, Dishonored I and II, most of the Hitman games, and probably the best, simplest, grandest, most memorable: Shadow of the Colossus. Dark Souls didn’t come out until... 2011, I think? So it’s not nostalgia, I can confirm the world design is unusually great and memorable. The world is connected very well and you can see other areas in the distance before you visit them. There used to be an online 3D map viewer but I can’t find it. I’m sure you believe me though. Metroid Prime was very similar. And it also had objectively good and subjectively memorable world design. And Asheron’s Call dungeons. Those were also memorable. Not because they were good, but because I’ve spent 80 hours in most of them. I never played any of the Dark Souls games. I didn't care for Metroid Prime; it came out about the same time as Super Mario Sunshine and The Wind Waker and they all seemed too childish at a time when Hitman 2, Morrowind, Neverwinter Nights and Splinter Cell were all brand new. I also failed to mention it earlier, but there's a part in Uncharted 2 that is set on a train that's pretty amazing. Not really architecture I suppose, but the details and action are excellent. And, again, not really architecture, but riding your horse around in Red Dead Redemption's old Mexico was pretty freaking great. Last edited by Steven; 07-07-2018 at 01:04 AM. I didn't care for Metroid Prime; it came out about the same time as Super Mario Sunshine and The Wind Waker and they all seemed too childish at a time when Hitman 2, Morrowind, Neverwinter Nights and Splinter Cell were all brand new. It's funny, at the same time I had the same thoughts and was really into Splinter-Cell and Neverwinter Nights among others. I hated Nintendo aesthetic because it was too cartoony or whimsical. This year I borrowed a Wii u and played the HD remake of Windwaker and really adored the experience. It was like a cool glass of liquid childhood whimsy and pouring it into my eyeballs. The controls and mechanics were tight, and if I hadn't known any better I wouldn't have guessed the game came out over a decade ago. I've tried windwaker 3 or 4 times, most recently the HD remake, and after 3 or 4 islands/dungeons I get so tired of the boat sequences I just lose interest and stop playing It's such a shame because I agree that the controls are great, the graphics are great, and the dungeons (the ones I played so far anyway) are amazing. I just wish there was a way to play without ever having to get in the stupid boat. I'll admit that part of the game can be pretty monotonous, though for the HD release they included the Swift Sail, which nullifies the need to direct the wind with your wand, and instead automatically puts a prevailing wind at your back, allowing you to move pretty quickly. There is also the Ballad of Gales which gives you access to a cyclone that will teleport you to different areas of the map. Both are accessible pretty early in the game. That level (purported to be Coruscant), an actual one from the commercially made compooter game Jedi Academy, still manages to annoy the hell out of me. Planet Sith and Yoda's House are artistical masterpieces compared to that s***. In retrospect, JA did have plenty of good custom SP campaigns (even if the best one of them all will always remain unfinished), but the core game itself is trash (IMO) and that level is the worst in the bunch. So I wouldn't recommend anyone who hasn't played JA before to start playing it now. So in this regard, that level is indeed quite memorable for moi. Last edited by Nikumubeki; 07-15-2018 at 01:42 PM. That looks like something whipped up by someone with 10 things to do and the time for only 5 of them.